Adobe has released the Digital Publishing Suite (DPS) Single Edition for iPad as part of its Creative Cloud slate of offerings. This app, which features a heavily Mac-oriented workflow, is the latest in a series of cloud-based releases from Adobe that encourage users to migrate from perpetual licenses to subscriptions. With the DPS Single Edition, subscribers who create single-issue iPad apps can do so in volume for a deep discount. The DPS Single Edition is targeted to small and mid-size publishers, freelance designers, and agencies that use Adobe's InDesign software to create one-off editorial applications for the iPad for themselves or for clients. These include brochures, annual reports, personal and business portfolios, and other content that does not update often or at all. This version features a streamlined workflow, quick testing between desktop and tablet, apps that can be optimized for both standard and Retina iPad screens, and apps that can be updated after App Store submission and approval. With this release, Adobe has built in a huge advantage for Creative Cloud subscribers by letting them build an unlimited number of apps for Apple’s App Store for the regular subscription price of $50 per month. In contrast, InDesign users who are not subscribed to Creative Cloud must pay the usual $395 fee per iPad app. Adobe Creative Cloud, the company's recently released subscription service for creative pros, lets subscribers download and install all of Adobe’s Creative Suite desktop applications and throws in online file storage, sharing, collaboration, and publishing for a single monthly fee of $50 for individuals and $75 for teams, based on a year's subscription. 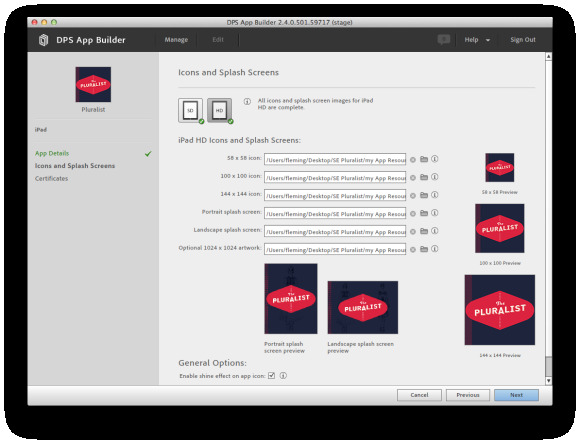 With the DPS, designers can mock up editorial projects visually in InDesign to create and build a .folio file and then move directly from InDesign into the DPS App Builder (a Mac-only application), where they actually produce the app. Designers can mock up editorial projects visually within InDesign to create and build a .folio file. Designers then preview and test the app directly on the iPad as they create tablet-based interactivity such as 360-degree object rotation or image panoramas. They can plug in and sync their designs between their desktop and tablet via USB and immediately switch back and forth from the original file for testing and tweaking of audio, links, touch gestures, slideshows, and other interactive elements. They can also share content with clients and colleagues. When complete, the app is then submitted to the Apple App Store via Apple's standard app submission process (which is also Mac-only). Unlike enterprise editions of the DPS, customers can update their Single Edition apps at no additional cost after they have been submitted to (and approved by) the Apple App Store. If there's a change to a file, it will be updated to viewers via a software update from the Apple App Store, and the new version will replace the old version on the iPad. 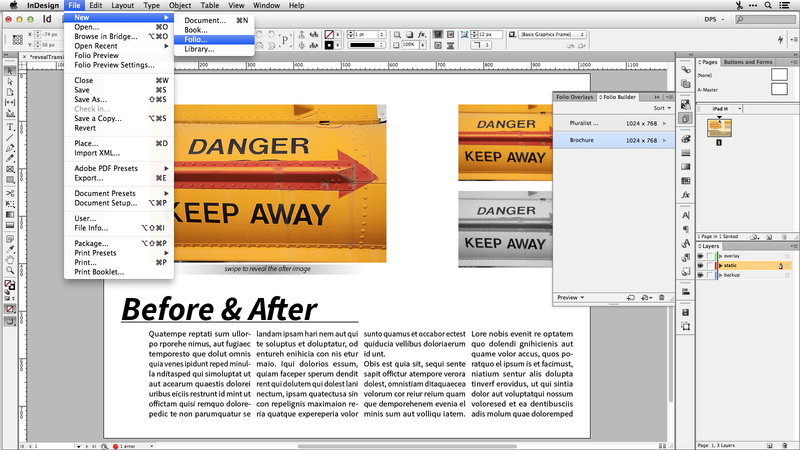 The DPS is compatible with InDesign CS5, CS5.5, and CS6. Content created with it can be viewed on all versions of Apple's iPad. 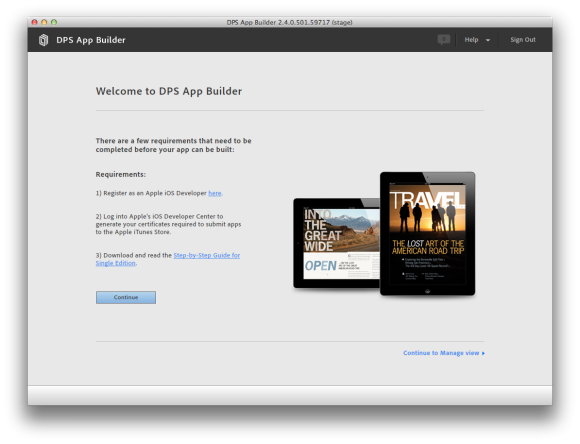 Additional information about the DPS Single Edition is available on Adobe's website.